The Olympus SZ-30MR is the first compact, Olympus claims, to record simultaneous 16MP stills and full HD video. 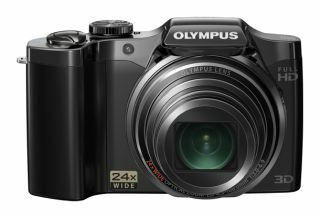 Olympus has added to its 'super zoom' range of compact cameras with the new 24x optical zoom SZ-30MR, the company has revealed. The new slim 'flagship' camera features an equivalent focal length of 25-600mm and is the first camera ever, Olympus claims, to offer simultaneous recording of 1080p Full HD movies and 16-megapixel still images. The Olympus SZ-30MR also features a Multi Recording function, an Olympus spokesperson tells us, where the camera twin Dual Engine TruePic III+ image processors can either record simultaneously in more than one mode. For instance, users can record two movies at once - one in wideangle and one in close-up range. The spokesperson used the example of recording a children's play. The Olympus SZ-30MR can record the wider view of the whole stage, while at the same time in a separate box zooming in on your own child and following his or her actions at closer range. The Olympus SZ-30MR price is set for £299.99 and will be released in late April, available in silver and black. Also due out in April is the Olympus SZ-20, which boasts a 12.5x optical zoom (24-300mm equivalent), full HD movie capability, Dual Image Stabilisation and a 16-megapixel CMOS sensor. The Olympus SZ-20 price is still to be confirmed.